Getting licked by a giraffe was exactly what we needed after weeks of worry and exhaustion. Flirtaceous eyes spied our little paper snack bag and she swung her brown speckled neck in our direction. Her rough sandpaper tongue and mushy lips snuffling for food pellets had us laughing out loud, which we had not done in a while. Laughter is not a good remedy for coughing, per se, but it was medicine for our spirits, even as the giggling forced Caffrey onto a bench for another body-rocking hacking spasm. Since we had descended from Mt. Kilimanjaro nearly two weeks ago, Caffrey had developed an increasingly awful respiratory cough. It had persisted through our Tanzanian safari, intensified during our time in Zanzibar and continued to rage in Mombasa. It was worst at night; ceaseless coughing all. night. long. When he was calm enough to proceed, we ambled slowly towards the hippo pond, barely eeking out a win over Mzee, Haller Park’s famous 130+ year old tortoise. Our slow pace aside, the important thing was that Caffrey was outside and able to enjoy a little of Mombasa’s warm sunshine. Haller Park has a history of soothing souls. 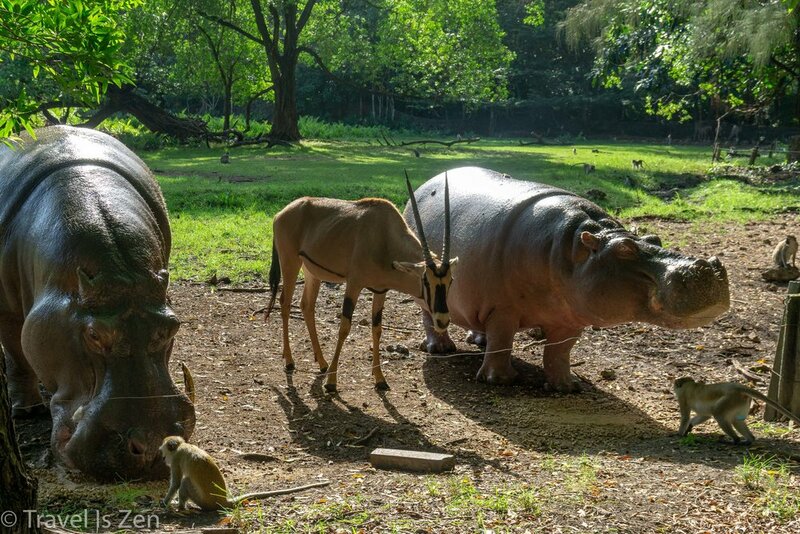 In 2004, the disastrous tsunami in the Indian Ocean left a baby hippopotamus orphaned. The rescued and frightened infant, named Owen, was brought to Haller Park, where he bonded with Mzee, the tortoise. The two became besties until Owen eventually paired with his mate, Cleo, and met new friends. Most of the animals in Haller Park share a similar story of rescue and sanctuary. The park itself is a tale of patience and rehabilitation. 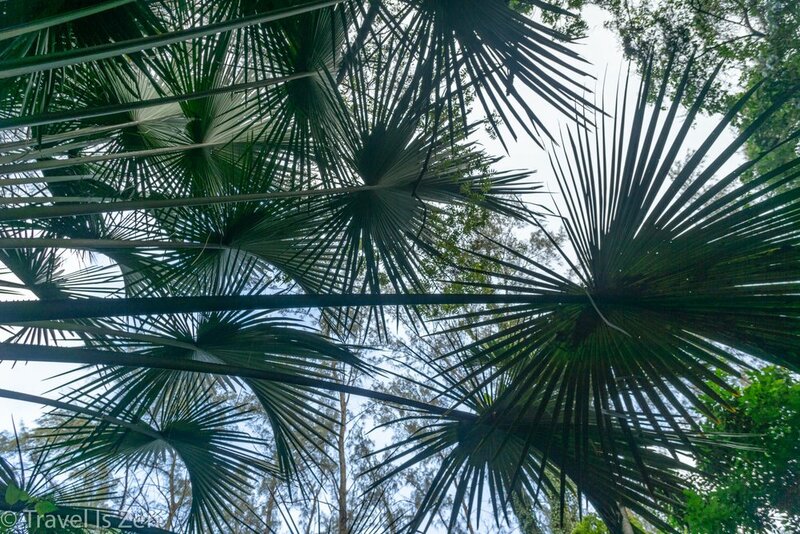 Now a lush, verdant garden paradise, Haller Park was originally a limestone quarry wasteland until Dr. Rene Haller, a Swiss naturalist, convinced Bamburi Cement Company to let him try a reclamation experiment. Dr. Haller had been hired by the company to grow fruits and vegetables for its employees (nice perk! ), but in 1971, they backed his efforts to rehabilitate the barren, inhospitable excavation site seven miles north of Mombasa. After some extensive trial and error, Dr. Haller found just three tree species able to withstand the harsh growing conditions within the quarry. 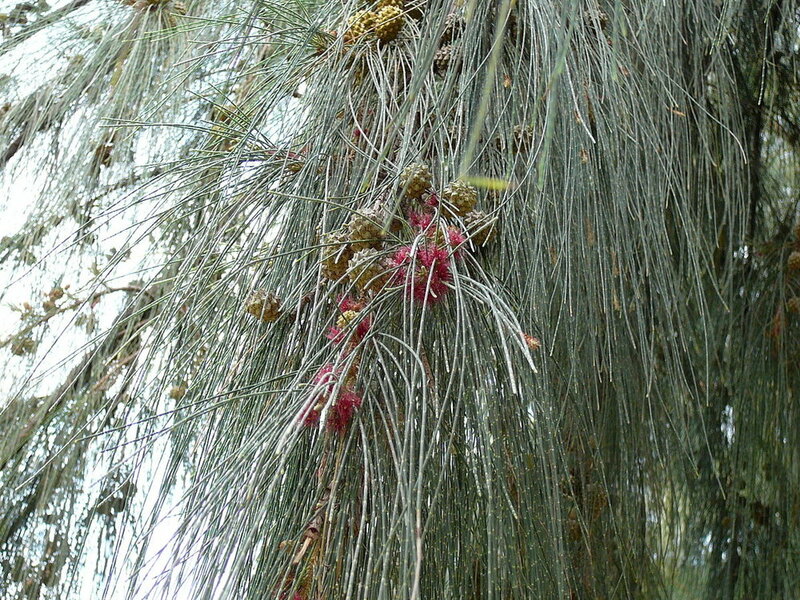 Of those three species, only the Casuarina, a type of tropical pine tree, showed any promise. As the fledgling Casuarina trees shed their tiny needles, micro-organisms were unable to break them down. This halted the production of hummus accumulation necessary for fertile soil buildup. One day, Dr. Haller spied a red-legged millipede (Epibolus Pulchripes) happily munching on some Casuarina needles. He introduced several hundred millipedes into the environment. As they ate the needles, the micro-organisms fed on the millipede droppings. After a period of five years, a layer of soil accumulated, the Casuarinas began self-seeding, and the rehabiliation program was finally moving forward. As the soil thickened and became more nutrient-rich, other plant species were introduced, either by design or by fate, carried by wind and animals. The quarry slowly developed into a haven for endangered plant species. As the plant species diversified, so did the animals that came there to live and feed. 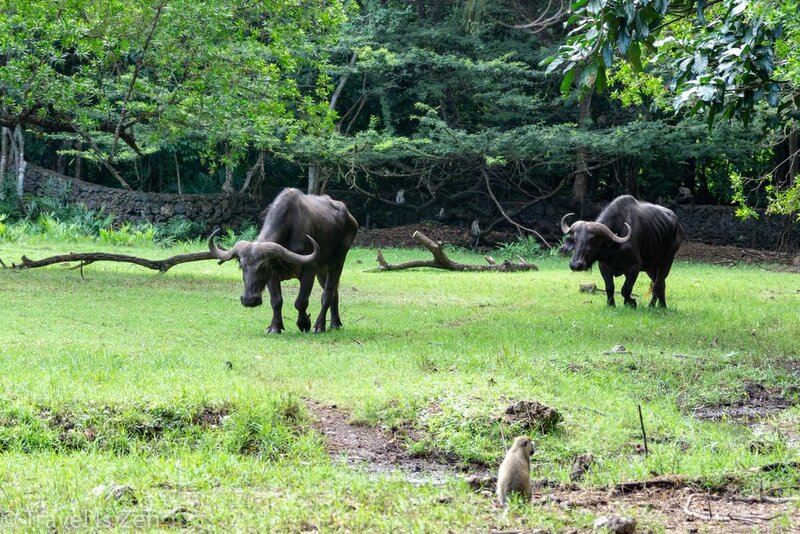 Dung beetles, bush pigs, termites, birds, and monkeys began settling into the park. Dr. Haller purposefully introduced more mammals into the environment: giraffes, elands, hippos, tortoise and oryx. The natural water condition of the lowland park on the shores of the Indian Ocean is brackish. Dr. Haller created a natural water treatment area using cabbage ponds and rice fields to filter the salt content. 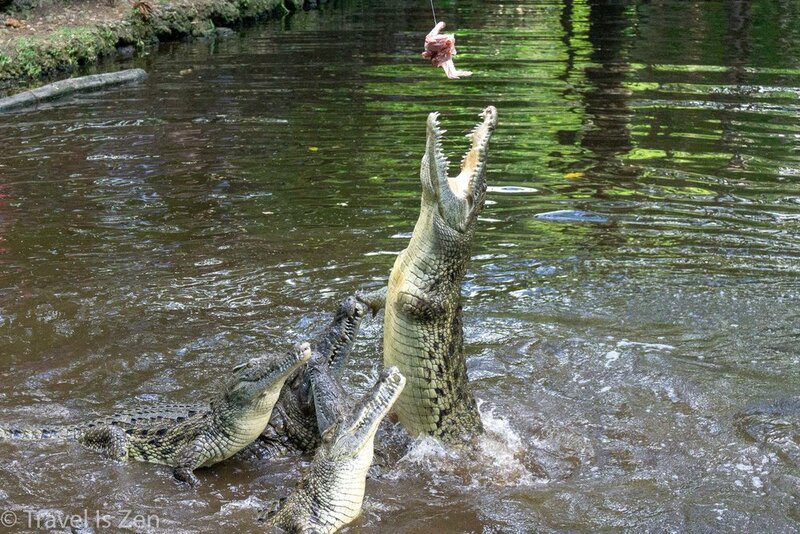 Then he started an aquaculture farm, introducing fish and crocodile (to feed on fish and plant waste) into the park. Our visit to Haller Park did not cure Caffrey’s respiratory condition, but it provided a day of rest and respite. Much like the endangered wildlife that inhabit the sanctuary, we felt peaceful. I can’t say for sure whether it was the new asthma medications he had purchased in Mombasa or Dr. Haller’s magical refuge, but Caffrey slept that night better than he had in weeks. 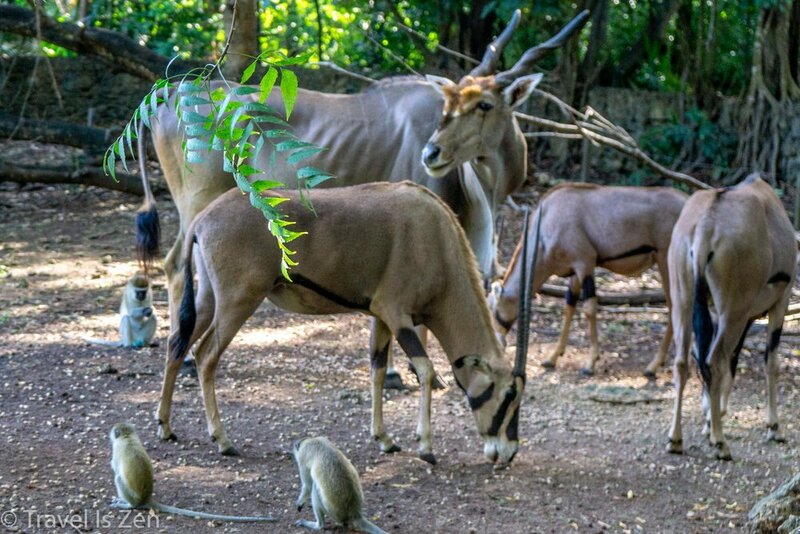 Traveling to Mombasa, Kenya? Did you know that Mombasa is an island? Leave us a comment or tag us on social media with your impressions of this crazy city!